At Streamroot we know that no two broadcasters are alike, and that every video workflow is unique. This is why we build products that are readily customizable to fit our clients’ particular needs. 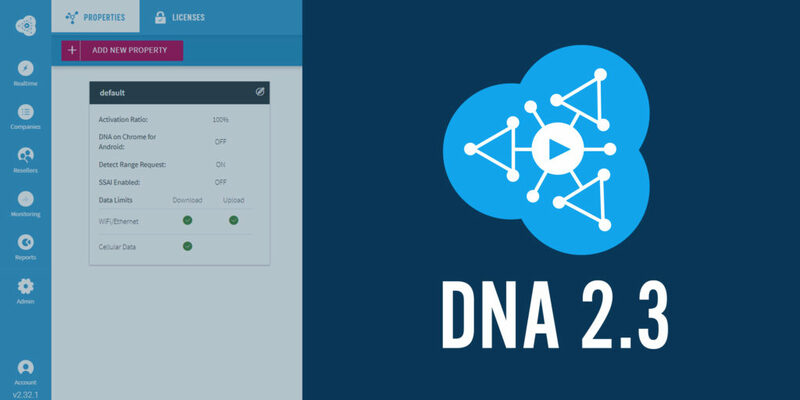 Today we’re excited to share with you Streamroot DNA™ 2.3, which makes customization more accessible than ever. No need to change your code – you can now apply granular settings on the fly, directly from your dashboard. SSAI Insertion – In May we announced full support of Amazon Media Tailor and Google DAI Server-Side Ad-Insertion, ensuring maximum efficiency and uninterrupted personalized ad service. We’re happy to share that you can now enable SSAI detection directly from your dashboard. upload / download activation per network-type – you can now easily activate or deactivate peer-to-peer upload and download directly from your dashboard, according to network type: Wifi and Ethernet or Cellular and other, which includes mobile networks, bluetooth and wimax. For more information on how to set up these parameters, see Properties documentation. Last January, we introduced multi-region redundancy which provides an additional fail-safe layer to our services, ensuring that your traffic is always smoothly delivered with Streamroot. Though lack of connection to Streamroot’s backend has no impact on viewers’ experience – backend redundancy is a top priority at Streamroot – especially when World-Cup-scale live events are concerned. We’re therefore happy to share that we’ve further optimized our backup algorithms to make full recovery time shorter than ever; only a few minutes are required to seamlessly switch all requests to another region. You can now easily increase your Streamroot account security and prevent unauthorized use of your secret Streamroot Key by whitelisting both your domains and apps on our new Licenses tab. Go to Settings > Licenses to add your domains and bundle-IDs. We’re thrilled to announce that Streamroot DNA™ now includes an improved IPV6 connections management mechanism, which translates into improved efficiency for devices using IPV6. With global penetration nearing 25%, IPV6 has a significant importance in our efforts to be compatible with 100% of broadcasters’ traffic and achieving maximum traffic efficiency. At Streamroot, we work hard to constantly improve our product. We’re happy to hear your feedback, so please share with us your thoughts. Not using Streamroot yet? Request your free trial today to start boosting your delivery, improve QoS, and gain access to our latest features.